Secondary hydrocephalus – a condition in which there is an accumulation of cerebrospinal fluid (CSF) within the brain. Zakhar is visually impaired, he cannot sit and walk. “It is only with the heart that one can see rightly; what is essential is invisible to the eye” – that’s about Zakhar Ignashov. The boy has hydrocephalus, a condition in which there is an accumulation of cerebrospinal fluid (CSF) within the brain. The boy is visually impaired und says only some phrases. Zakhar is premature baby, born with the weight of 1200g. Hospitals and rehabilitation centers have become a second home for the family. Against all the expectations of doctors the boy didn’t get better. At the age of 9 months Zakhar said his first words, but he cannot still sit and walk. “We say millions of words, that are sometimes empty and needless. Zakhar speaks only if it’s really important, if he misses his father or granny”. Zakhar has vision problems but the most important things still remain in boy’s life: a close-knit, caring family and deep, sincere feelings. The only thing needed is a wheelchair. “You become responsible, forever, for what you have tamed. And I must do everything possible to make my son’s life happy and joyful. In the real world, however, it often turns out to be far more difficult. And I have to accept the fact that now I cannot collect the necessary amount of money to buy a wheelchair on my own”. 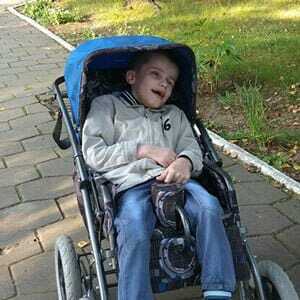 Let’s buy a wheelchair for Zakhar!